Are you drunk, stoned or stupid? That is the goal of this game - all of which are not titles you should be proud of. Oddly enough, players are trying to be the first to get negative 7 points so they can be the first looser. How more backwards can this adult card game get? Making up witty answers to the questions or topics presented will help you "loose" the game. Game play is so backwards and off that is makes things fun as a party game for your friends that have nothing else better to do. You can even save a few bucks and make your own Drunk Stoned Or Stupid game with the manufacturers pattern that they provide on their website (although you'll only get 50 of the 250 question cards). Get negative 7 points and you're the looser of the game. 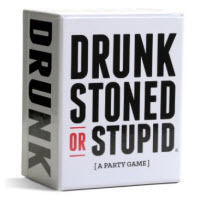 250 cards with the official game rule and instructions will come with the card game Drunk Stoned Or Stupid. Please keep in mind that the official Drunk Stoned Or Stupid dice-card rules and instructions could be different depending on the game version you have. The rules below are some of the exact directions on how to play Drunk Stoned Or Stupid. Share with us your comments, funny stories, tips, advice, strategies, creative ways to play, questions about how to play, problems with the rules or anything you want about Drunk Stoned Or Stupid. All submissions will be reviewed within 24 hours. Click here to add your Drunk Stoned Or Stupid comments. I tried to make my own game by printing out the cards and I have to say the time and effort it took wasn't worth it. I should have just bought the game. Maybe I was drunk, stoned or stupid when I thought it was a good idea to diy it from the rules.